A little over two weeks ago, when I stopped by Audi Wilsonville to pick up a Misano Red 2013 Audi S4 as a loaner for the weekend, there was a lovely Misano Red 2013 Audi S7 parked in the service area that had just finished getting detailed. 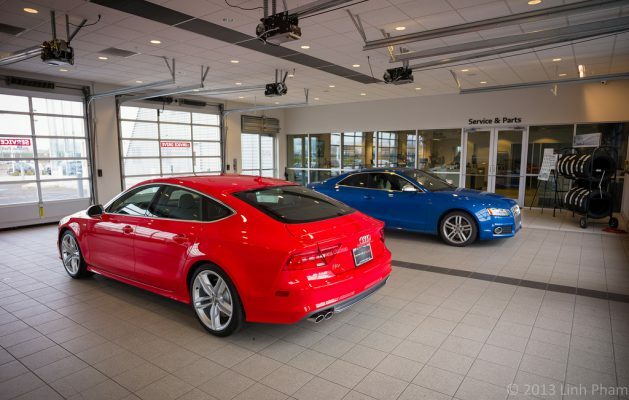 This would be the first time that I got to see the new 2013 Audi S7 in person. The base Audi A7 already makes a great presence wherever it is and the S7 adds a bit of edge with the S-specific grille, honeycomb mesh motif and other S badge garnishes. This particular S7 is wearing a 20-inch version of the five parallel-spoke wheels that had been available as the standard 19-inch wheels for the pre-facelifted Audi S5 (including mine, when set up with its summer tires). The customer who ordered this red S7 opted to go with the black leather seats with honeycomb stitching and the Carbon Atlas inlays. 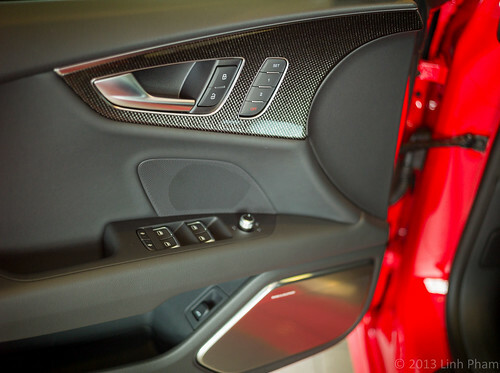 The S7 also includes S-specific lighted door sills. Oh, and there’s also the Bang & Olufsen sound system. Even with all of the S model specific trims, gadgets, and bits and bobs, the most important thing about the S7 is the biturbo 4.0-litre V8 engine and the seven-speed S Tronic dual-clutch gearbox that sends 420 HP to all four wheels. Impressively, the engine is able to motivate this 4,500 pound (plus or minus a couple dozen) beast to 60 MPH from a standstill in 4.5 seconds. 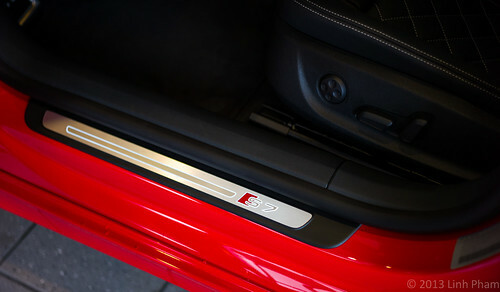 And just think, we’ll be getting the even more hotted up RS 7 in the United States in the near future. 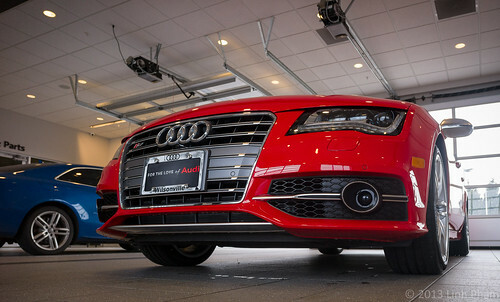 Yeah, it’s a pretty good time to be an Audi fan… well, except for the lack of Avants and diesels in the volume sellers. But I digress, the S7 is a gorgeous sportback and the owner of this S7 is going to will absolutely love it. 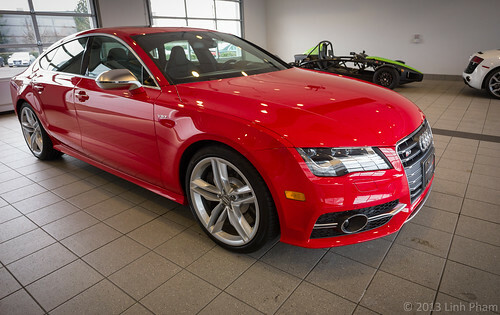 As always, a huge thank you to Scott Mitchell and Audi Wilsonville for letting me take some photos of the car. 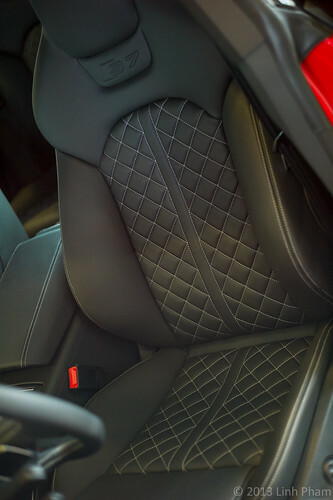 Additional photos can be found in the “18 Jan 2013 – Red 2013 Audi S7” set as part of my Flickr photostream.